Science fiction has gained a steady following over the twentieth century, owing in part to its preoccupation with the “Future.” As writers like Margaret Atwood and Samuel Delaney have observed, science fiction is written on the peripheries of the known world. Thus, we will chart a course on the coordinates of the unknown to delineate a long history of this popular genre. While the current form rose to prominence after the Second World War, science fiction has a series of important prequels, going all the way back to the sixteenth century with Thomas More’s Utopia. 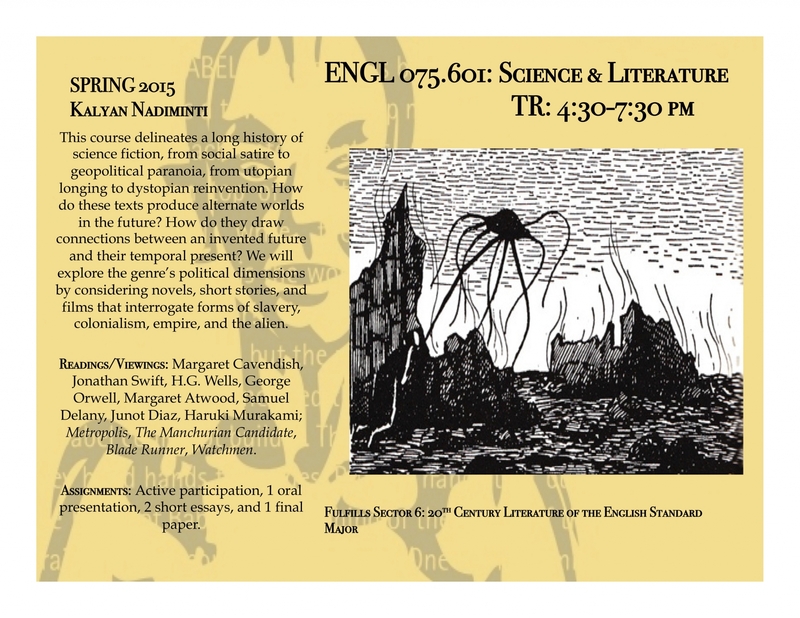 This course will introduce students to modes of thinking and feeling that have contributed to science fiction’s longevity, from social satire to geopolitical paranoia, from utopian longing to dystopian reinvention. How do these texts produce alternate worlds in the future, and to what end? Are they hopeful, critical, or both? How do they draw connections between an invented future and their temporal present? Readings will include canonical literary works like Margaret Cavendish’s The Blazing World, Jonathan Swift’s Gulliver’s Travels, and George Orwell’s Nineteen Eighty-Four, as well as genre specialties like Margaret Atwood’s The Handmaid’s Tale, Samuel Delany’s Empire Star, and Haruki Murakami’s The Windup Bird Chronicle. We will learn about the lively connections between speculation and lived experience by turning to Possible Worlds theory and debates around realism. We will simultaneously consider the genre’s political dimensions by reading novels that interrogate forms of slavery, colonialism, empire, and the alien. Switching mediums towards the final third, the course will feature film and television series like Star Trek and Star Wars to understand science fiction’s fascination with technology and the future. The course is designed to help students deploy critical vocabulary around issues of race, class, gender, and sexuality. Assignments will include two close-reading pieces, one group presentation, one final paper and one short story assignment deploying any science fiction sub-genre of the student’s choice.